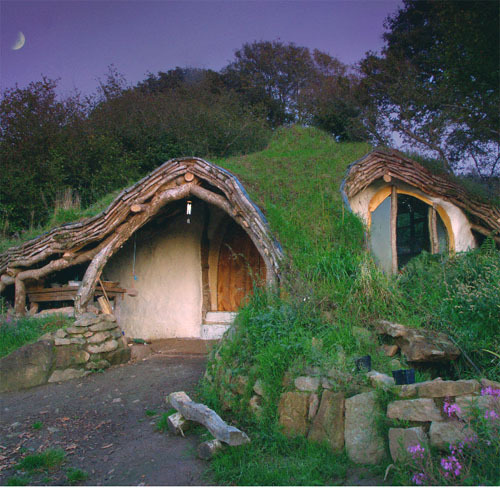 One of the most popular places to visit at GBE concerns buildings on the cheap, the remarkably alluring Hobbit-like house Wales residents Simon and Jasmine Dale built into a hillside using a hodgepodge of used and organic materials. Their estimated cost for the entire project came in at less than $5,000. This was a tremendous accomplishment for a young couple with two children and very little money, a reality that is all too familiar to a significant sample of our population. (Maybe there should be a new LEED rating just for building so inexpensively: Sustainable Financing. This is one mortgage bill that’s not going to be haunting their mum and dad for years.) Inside there’s a wood-burner for heating – waste wood in the old-growth forest is locally plentiful. To get the most of the heat, the flue goes through a big stone/plaster lump to retain and slowly releases the warmth. The Dale family did not stop at their Hobbit house. Visit his website, Being Somewhere, to see more remarkable magic and sustainable practicality. “Since 2003 we have been living and building on the land, working in environmental projects and community. We have found that for a few thousand pound and a few months work it is possible to create simple shelters that are in harmony with the natural landscape, ecologically sound and are a pleasure to live in. 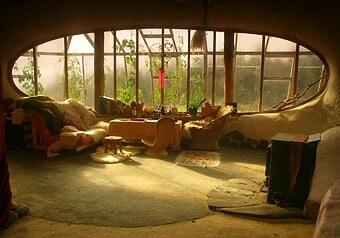 There is something powerfully alluring in such natural buildings. Their simplicity and cost makes them accessible; their beauty and use of natural materials remind us of our ancestral right and ability to live well as part of the landscape/nature/earth. We believe this dream is possible for anyone with genuine intention, will and hard work.